Do you ever have an item in the produce department calling your name...and you notice it is on sale so you decide to buy it, but have no idea what you will make with it? That was the case with me last weekend, when I walked past the fresh cranberries. I assume they were on sale for Thanksgiving, and the many people who would be making cranberry sauce, but I wasn't planning on making any sauce. Something about the beautiful little red berries had caught my eye, and before I knew it I was buying them. Now, I suppose I could have made some sort of delicious baked good with them such as a cake, or made them into a relish to serve with some tempeh, but for whatever reason I decided that they might be good roasted and tossed into a salad! I didn't know if this would work, or if they would hold together in a salad once roasted, but they ended up being fabulous! Now, I did not simply throw them in with greens and a bit of vinaigrette, I made a salad fit for a Thanksgiving spread! Sweet roasted kabocha squash cubes, salty roquefort, and toasty maple chipotle walnuts joined the tart little berries in my autumn salad, and it was all quite delicious! 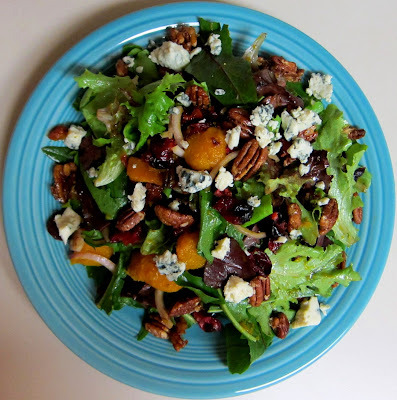 If you have a little time to make a salad, or would like to try cranberries in a new preparation, then this is your dish! Try it out, and your taste buds and tummy will thank you! Preheat the oven to 475 degrees. Line three baking sheets with foil, and spray with nonstick spray. Place squash cut side down on baking sheet and roast until tender about 30-40 minutes. Remove from oven and let cool. Remove skin and cut flesh into 1 inch cubes (you should have about 2 cups for this recipe). Toss cranberries with just enough maple syrup to coat, and spread out on another baking sheet. Sprinkle with a little maple sugar and roast until just starting to soften, burst and slightly brown about 10 minutes. Remove from oven and let cool to room temp. Decrease the oven temperature to 375 degrees. Toss pecans with honey, maple sugar and sea salt and spread out on one of the sheets. Roast in the oven until fragrant and starting to brown, about 7-10 minutes. Remove from the oven and let cool. Meanwhile, whisk dressing ingredients together in a small bowl. Combine greens, shallots, roasted squash and cranberries in a large bowl, pour dressing over, and toss with hands to coat. 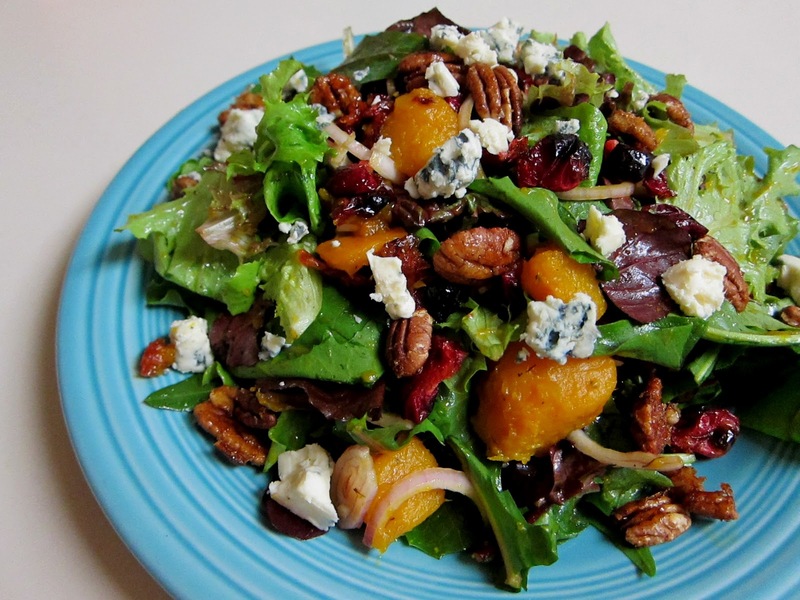 Divide salad between 3 plates and top with toasted nuts and roquefort. This looks like a lovely salad. I've never had kabocha squash, never even heard of it until reading about it on other people's blogs. Sounds like a must-try! I always buy food just because it's pretty. I'm glad I'm not the only one! Salad looks amazing! Your salad look really good!